You can choose to designate the Foundation as a beneficiary of specific gifts of cash or property, or designate a percentage of your estate to the Foundation in your will or trust. This option can reduce the amount of inheritance tax your heirs may encounter, while also allowing you to leave a legacy of generosity. 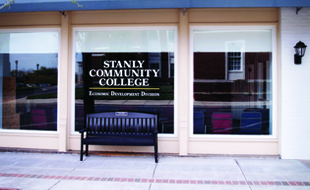 (704) 991- 0370 or jmartin8295@stanly.edu. Your financial institution may allow for a donor-advised charitable giving program designed to assist you in making tax deductible contributions to a charitable giving account. You can then advise how your contributions are invested to grow your assets and designate the charities you would like to support. A charitable gift annuity allows you to donate assets that are immediately invested by the Foundation. The donor will receive fixed payments for life and can even designate payments for the life of a beneficiary. Once all commitments have been fulfilled, the funds are made available to the Foundation. This gift allows the donor to receive payment while also allowing for a charitable tax deduction for a portion of the gifts worth. Did you know that as much as 39.6 percent of your retirement plan assets can be absorbed by taxes when given to your family? One way to eliminate taxation of these assets is to make gifts to tax-exempt charitable organizations and leave less heavily taxed assets to your family. To designate the Foundation as a beneficiary, speak with a tax advisor, then inform the plan administrator of your decision and complete the necessary documentation. Gifts of appreciated security such as stocks (including mutual fund shares) and bonds held long-term may be fully tax deductible, including the difference between what you paid for the security and the fair market value when donated. Your broker may electronically transfer securities to the Foundation broker or unsigned stock certificates can be sent by certified mail to the Foundation office. By choosing this option, the donor receives an income tax charitable deduction for the full fair market value of the gift while simultaneously eliminating any capital gains taxes. If you are interested in the tax benefits of a charitable gift of real estate, but you would like to continue living in your personal home for your lifetime, the gift of a retained life estate may be right for you. You would give a personal residence or farm to the Foundation while retaining the right to occupy it for life. The property does not have to be your primary residence, but it must be a personal residence (such as a vacation home). You would still be responsible for property taxes, maintenance costs, and insurance, but would receive numerous tax benefits. Life insurance is another way to provide a gift to the Foundation. This could be done by purchasing a new policy and designating the Foundation as the beneficiary, or by gifting a policy that you currently own and no longer need. Designating the Foundation as the beneficiary of your policy will still give you the right to change the beneficiary at a later date and you would retain ownership of the policy. In this instance, your estate would receive a charitable tax deduction when the proceeds are paid to the Foundation. If you would like to receive a current federal income tax deduction, you would need to designate the Foundation as both the owner and beneficiary of the life insurance policy. The deduction will be based on the policy’s cash value or your cost basis. Many employers support and encourage their employees and/or retirees to be personally involved in the wellbeing of their community by donating to charitable organizations of their choice. An organization’s matching gift program expands the impact of a donor’s gift by matching the gift to qualified organizations (up to a designated percentage). The individual and employer receive tax benefits when gifting through a matching gift program. The emergency fund is a valuable resource that helps students who may find themselves in a difficult financial situation. The funds assist students with various bills such as heating, vehicle repairs and utilities. All donations to the Emergency Fund are tax deductible for the donor. You may choose to give a gift of cash or check to the Foundation. Your gift is tax deductible and can be made in honor or memory of loved ones you would like to recognize. You may be willing to donate your time to support the Foundation in accomplishing its mission each year. The Foundation has numerous volunteer opportunities. For more information on these opportunities, please contact the Foundation Office. Annual scholarships and awards may be accepted at any time during the year, but must be received by the Foundation office by March 1 for the scholarship to be awarded the following fall semester. A minimum of $500 is requested for general scholarships with half of the donated amount to be awarded in both the fall and spring semesters. A set of operating guidelines will be established by the donor and agreed to by the Foundation. Once all funds have been expended, the scholarship will cease to be awarded. 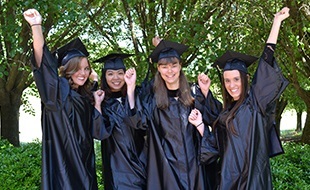 An endowed scholarship is one in which the initial funds given to establish the award are invested, and only the return from the principal may be distributed to fund the scholarship. Endowed scholarships are awarded on an annual basis under operating guidelines established by the donor and agreed to by the Foundation. A charitable contribution of real estate - whether it’s acreage, farm, home, commercial building, etc. - will provide the donor with several advantages. When you give the gift of real estate to the Foundation, you establish a visible testament of your support of our mission. Donors receive an income tax charitable deduction for the full fair market value of the property and eliminate tax on the property’s appreciation. Donors, including community organizations, may contribute non-financial resources and/or services to the Foundation. Please consult your tax advisor to determine the acceptable tax deduction. 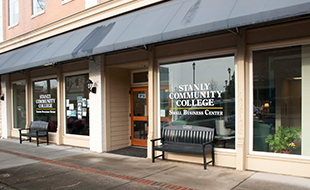 If you have included Stanly Community College in your estate plan or through another planned giving technique, we would like to know in order to properly recognize your generosity. We would like to offer you membership in our Legacy Society. As you are comfortable, please contact the SCC Foundation office to provide us a description of your planned gift.